This clean and green stock could be a money-making machine. NextEra Energy (NYSE:NEE) is not your average dividend stock. A major renewable energy player, investors are increasingly eyeing NextEra as a solid income stock with growth potential. So what needs to happen for NextEra Energy stock to realize this potential? While many utilities have worked hard to develop a diverse energy portfolio, NextEra Energy is deep into wind energy. The company has over 100 wind farms spread across 19 states and Canada, capable of churning out more than 10,200 MW of power. That's equal to around 56% of NextEra Energy's total generation, multitudes beyond the near universal zero or single-digit wind capacity of other utilities. NextEra's stock is directly linked to wind energy's success, which in turn depends on technological improvements and/or supportive policy. Through various tax credit and renewable energy programs, the U.S. government has made a concerted push to put wind energy on the map. Now, with companies like NextEra firmly entrenched in the clean, never-ending fuel source, the government will need to decide how much more help wind energy needs. The Environmental Protection Agency's (EPA) recently announced Clean Power Plan could go a long way to incentivizing more wind in certain regions. A further extension of a production tax credit could have a similar effect. And if wind continues to grow at recent rates, economies of scale should keep technology expanding and costs shrinking at unprecedented speed. While wind energy is gaining ground, America is increasing its reliance on natural gas at an exponential rate. Nationwide, natural gas is expected to overtake stalwart coal's generation as soon as 2035. Although NextEra Energy has embraced natural gas as a natural counterpart to its wind investments, its 22% stake is still much smaller than many other utilities like Southern Company's (NYSE:SO) 42%. Additionally, NextEra has "hedged" its natural gas bet with a $3 billion Spectra Energy (NYSE:SE) joint venture to build Florida's third major natural gas pipeline. Not only does the pipeline provide lucrative longer-term "toll booth" revenue, but it also serves as a simple way to make more money if natural gas prices increase again. 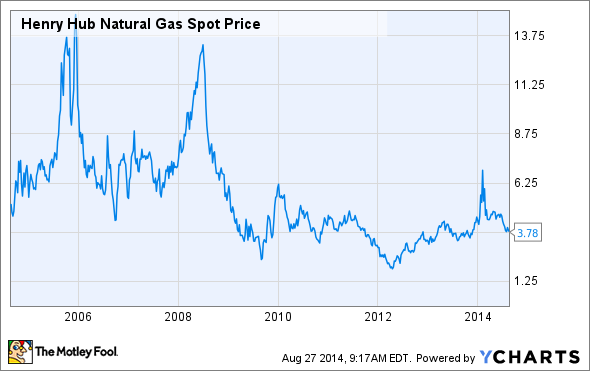 Simply put, if natural gas is worth more, companies will pay more to move it. And if costs prove prohibitively high, NextEra's wind and nuclear assets, which collectively accounted for more than 70% of 2013 capacity and generation, will become even more attractive alternative energy options. The charm of using coal for electricity has kept it as one of the most important ingredients in America's electricity recipe for more than a century. It's cheap, domestic, and its base load power can be turned on or off at the flip of a switch. But increasingly alarming environmental concerns are changing the coal equation, and Uncle Sam has been pushing hard to kick coal out of energy portfolios. While previous policies have elicited filters and scrubbers to reduce local pollution like harmful particulate matter (think "black lung disease"), the Obama Administration's recently proposed Clean Power Plan targets coal's climate change-inducing carbon emissions directly. If passed, this plan could tip the price competitiveness scales once and for all, causing companies to permanently kick their coal habit. NextEra Energy is ahead of the curve on clean power, and has zero coal-related assets on its books. With wind, solar, natural gas, and nuclear comprising 96% of its total generation capacity, NextEra is well within the compliance of any foreseeable policy. As coal continues to phase out, NextEra will continue to avoid expensive retirement, modernization, and conversion initiatives that have kept other utilities heavy with high spending and debt over the past half-decade. 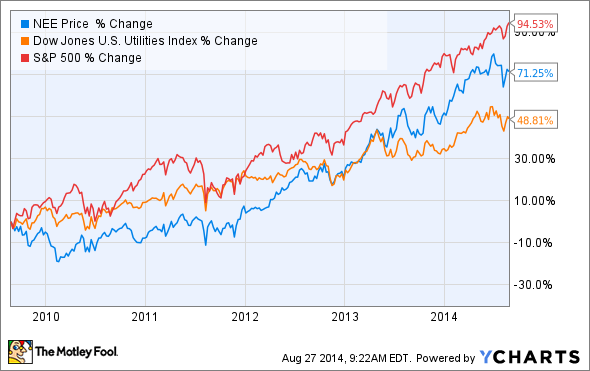 NextEra Energy has outperformed the Dow Jones U.S. Utilities Index by more than 20 percentage points over the last five years. Accordingly, various valuation metrics make NextEra out to be an "expensive" stock. But with a solid 3% dividend yield and a penchant for planning ahead, NextEra's price just might be worth it. And if wind picks up, natural gas prices increase, or coal is cut out entirely, NextEra Energy stock will be well-positioned to rise.